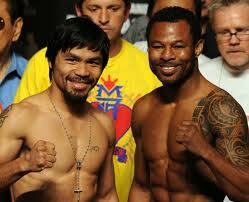 Manny Pacquiao retains his WBO world welterweight championship in a unanimous decision against Shane Mosley. The first early two rounds both fighters are in cautious mode while trying respectively measure their skills, speed and power. In the third round Pacquiao makes a two punch combination on the face of Mosley that makes him down to the canvass and his ever first taste of knockdown in the fight. In the fourth up to the last round, Mosley is always in the defensive mode while Pacquiao is on the offensive. Mosley makes a point to always backtrack to avoid the voluminous hard punches combination onslaught by Pacquiao. Mosley fails to use his right hand his lethal weapon in as much as he wishes but he can’t do it because he’s preoccupied to be on the defensive mode all the time throughout the fight. The fight goes the distance and ends in a unanimous decision. The 3 judges have scored: 119-108, 120-108, 120-107 in favor of Pacquiao.